Measure and add 8 cups of flour to the mixing bowl. Measure 1 cup of oil. 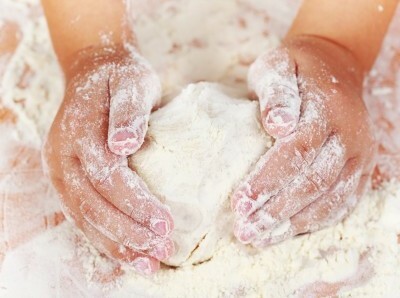 Use moulds with the cloud dough, pat it, smooth it out, and let the children explore the texture. Children will begin to make connection's between their movements and the marks they are making. Add glitter to the cloud dough to make it sparkle. Put the cloud dough in the freezer for a chilly sensory experience. Add flavour extracts like banana and strawberry to make it smelly. Use cloud dough in a sensory tray for mark making.